Practicing appreciation. Countering cultural appropriation. Cultural appropriation is the unauthorized taking of another culture’s dance, dress, music, language, folklore, cuisine, traditional medicine, religious symbols, etc. especially by those who represent a group in a more powerful social and political position. Cultural appreciation is approaching another culture with respect and courtesy by taking the time to learn about it, interact with people among the culture, and actually understand it (Metcalfe, 2015; National Bioneers Conference, 2018). Otahpiaaki workshops afford many opportunities to learn about protocol, artistic practices, materials, and the issues behind each unique artistic practice. We are thankful to welcome such a diverse series as a part of Pride & Protest 2018. All are welcome to listen, learn, and exchange. $40 per project (Includes a personal shawl + Community square). Main Street. Come for a day or spread your work out over several. Elder Carola Jones will share her one-of-a-kind knowledge and stories as a remnant member, daughter, granddaughter, and great-granddaughter of the Tuscarora Confederacy. Participants will learn about the indigo ceremony and protocol and will develop a hand-dyed shawl project, and contribute a tile for the Otahpiaaki 2018 Community Healing Quilt. 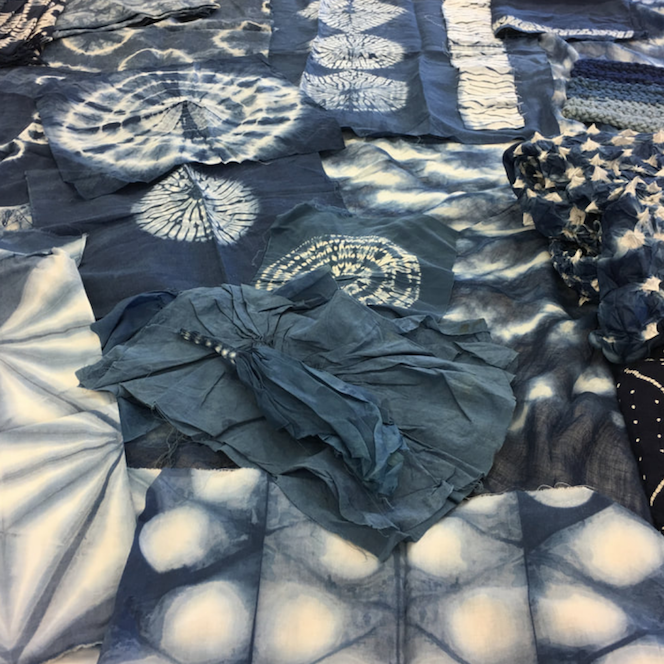 Otahpiaaki’s own indigo crops are featured as part of the project. Beading & Jewellery Making Circle – One Day Only! Wednesday November 7th: 10:00 a.m. – 2:00 p.m.
$10-$20 per piece. Main Street. With designers from 18 Nations at Otahpiaaki 2018, there are a wide variety of styles of beading, jewelery-making, materials, and handcrafts. Check the website for all artists offering drop-in classes, but expect Hand Rattle Earrings with Tara Sun, Pow Wow Earrings with Tobi Eagle Speaker, and wearable technology accessories with Angel Aubichon. Wednesday November 7th: 12:30 p.m. – 2:00 p.m. This event opens with a short lecture on the history of ledger art and is followed by an art-making session where individuals will make their own ledger art piece based on their own story. Thursday November 8th: 10:00 a.m. – 2:00 p.m. Pick your protest! Tala Tootoosis will fire up the sewing machines to guide you through a ribbon skirt perfect for Pow Wow; Jesse Gouchey returns with his oxidized t-shirts; and our very own Autumn Eagle Speaker will share all she knows about non-violent, high impact protest messaging and posters. Friday November 9th: 3:00 p.m. – 6:00 p.m. All Ages. U111. Otahpiaaki is pleased to partner with Indigenous Resilience in Music and Drum Beat Productions for this day of youth mentorship and creativity that explores Indigenous identity, resurgence and activism with Naát’áaníí Means. Develop your voice in circle and with the support of fellow learners and artists. Friday November 9th: 10:00 a.m. – 2:00 p.m.
Free. All Ages. EB 3047. Are you a creative youth aged 15 to 30? #RisingYouth and Otahpiaaki are partnering with four incredible artists Justin Louis (SECTION 35), Jesse Gouchey (Maskwa), NDN Family and Moe Clark for this hands-on creative workshop which includes your ideas and taking action to make them happen. You'll write a micro-grant for your creative project -- music, fashion, performance or any inspired idea. Learn how to get started and earn funding for your project! Tuesday November 6th: 11:00 a.m. – 12:30 p.m.
Otahpiaaki is pleased to co-present this panel of creatives with Voices – Calgary’s coalition of Two-Spirit and Racialized LGBTQIA+. Being folks with intersectional identities requires finding courageous pathways in pursuit of our goals in our communities. This conversation will explore pride in one’s identities and how intersectional pride cultivates courage, creativity, and growth. Thursday November 8th: 11:00 a.m. – 12:30 p.m.
dsquaw by Dsqaured2, Reservation Royalty by Party City. Changing the nature of intellectual property law seems like an insurmountable obstacle. Hear directly from designers and artists affected by the theft of their ideas and learn how technology and elders, an unlikely pairing move Indigenous designs into safer spaces, where prerogative, documentation and the ability to license or litigate are made clear to the design and fashion community. Decolonizing Research: Aistommatop - SOLD OUT! Free. MRU Faculty Centre. W315. Decolonize research, Indigenize research, or both? This panel discusses the ways in which Indigenous and non-Indigenous members of the academy are working through the problematics and opportunities of post-colonial scholarly approaches, including early learning, near misses, and mistakes made while breaking new ground in a variety of disciplines. Tangible examples of artistic production and journal writing will be provided.